As most of you know, my momma is one of my favorite cooks of all time. I cannot count on one or two hands how many amazing dishes she makes. Although I love all of them, there is one that has always been my absolute favorite and because I couldn’t handle not making it myself, I broke my rule of not asking for the recipe. Gasp! I know it’s hard to believe but I just couldn’t have it only when my mom made it and neither could JR. We had to have MORE. Today I wanted to share with you my mom’s curry chicken. 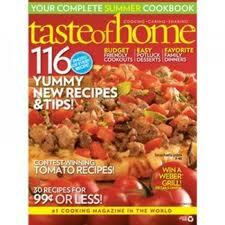 It’s an oldie from Taste of Home that mom fixed up and made her own special recipe. Today I share that recipe with you in hopes that every time you make it, you think of my wonderful mother. This recipe is simple and calls for very few ingredients. The first step is to get 2-4 boneless, skinless chicken and allow them time to thaw if frozen. 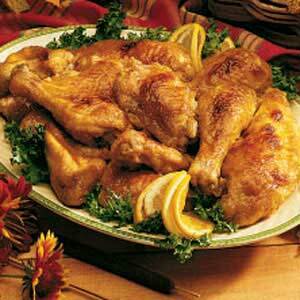 Once your chicken is about done thawing, preheat your oven to 350 degrees. Also, melt 4 tablespoons of butter in a saucepan. Once your chicken is ready, dry them and put them in a bowl with about ¼- ½ cup white wheat or whole wheat flour, 1 teaspoon salt, and ½ teaspoon cayenne pepper. Mix and coat well. Place in a well greased 9×13 pan and pour the butter mixture on top of it. I usually sprinkle a little more cayenne pepper on it. Place in the oven for 30 minutes. Once you have about 5-10 minutes left, melt ½ cup butter, ¼ cup sucanat, ¼ cup honey, 1/3 cup lemon, 1 tablespoon soy sauce, and 1 ½ curry powder together. Once the chicken has finished, take it out of the oven and smell that wonderful goodness. Take it ALL in. I promise you won’t regret it. In fact, if you want to open the oven every 5 minutes to smell it that’s ok, too. Anyways, when you take it out you’ll pour this next mixture on top of it. 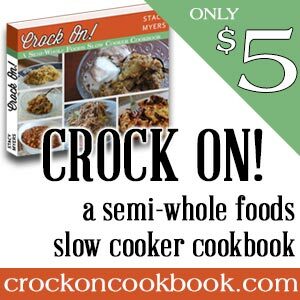 It will pop and sizzle and smell even better than before which to me seemed impossible. The recipe says to bake it another 30 minutes but we have come to find that the longer you cook it, the better. Our normal is 45 minutes. One night we went out for a walk and (accidentally) left it cooking for a whole hour and that even tasted amazing. I’m not sure there’s anyway to do this wrong! Have you ever seen the calm before the storm? I have seen a few of these in my lifetime and they’re always more terrifying that the storm itself. On Wednesday, April 27th, 2011, we had watched the news off and on all day and followed it closely at work. They were calling for bad storms and a potential tornado watch for the area. I was 5 months pregnant with Emma and I remember calling JR and telling him to get home right away. There was something about that day that just didn’t seem right. He came home and we ate dinner and prepared our downstairs area for the storm to hit. We had the news on and Dave Dierks, locally weatherman, was keeping us up to date on what was coming. As we watched, we heard it getting worse and worse outside and once the watch turned into a warning, we made our way downstairs and watched the news online (thanks to technology). Soon after, the power went off and we were left wondering what was going to happen. After two systems came through, we were told the worse was over and though we were still without power, we went on upstairs and went to bed. Shortly afterwards, I awoke to the house shaking with such force that I was terrified. As soon as it came it was gone, and we went to sleep. The next morning, we found out that was the worse hit and less than ½ mile from our house a severe storm came through and took out a lot of vegetation and damaged many houses in the surrounding area. We were very blessed that our house wasn’t hit because during the worse part, we were snug in our bed. 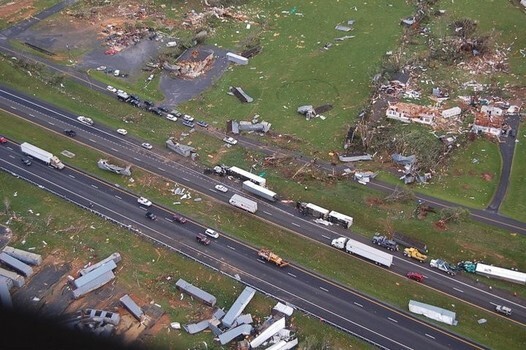 The tornado that hit that night (early morning Thursday, April 28th) killed 3 people in Glade Spring and injured well over 50. That could have been us and since then, we’re working to become proactive rather than reactive. Here is how you can do the same and just in time for tornado season. *We take watches seriously and warnings even more serious. If we know they’re calling for even a potential tornado, we make sure we’re home BEFORE it hits. Prior to 2011, we tried to be cautious but we weren’t too serious. If you add together 2011 plus having a child, you get very serious people. We never question if we’re going downstairs or not. If there’s a watch, we will wait until it hits and if it’s a warning, we don’t even wait. Downstairs we go. *We made sure our alarm system upgraded and now has a tornado watch/warning feature on it. It didn’t cost anything extra and that’s why we LOVE vivint. It alarms as soon as a watch/warning comes through our area and follows the same as our weather channels. This was awesome last spring when we had a warning at 9am and were still in bed on a Saturday morning. We weren’t watching the news and many people probably weren’t. 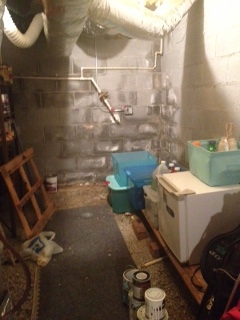 We called our loved ones as we made our way down to our basement. Food- preferably NOT snacks. 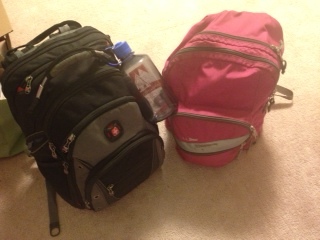 We packed assorted nuts in our bags and all our extra food is stored downstairs anyways. Game for JR and me (we chose chess since it’s a long game and can take up time)- this is NOT in our survival kit but downstairs in our safe zone. *We have a list. 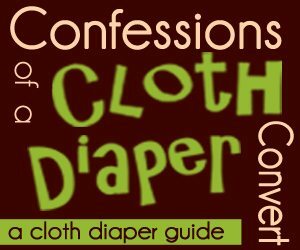 If we ever got in a bind and had to survive downstairs or even had to leave our house, we have a list that says what we need to bring. Some of these things may be upstairs but they’re non-essentials. 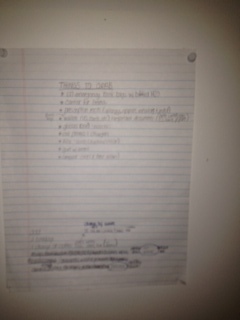 We keep this list downstairs with our kits so we know what we may need. These things will change as Emma gets older but we update them at least two times a year. This is how we prepare for emergencies. How do you prepare? Any additional tips? There are a few things in our lives that we really can say CHANGED our lives. We don’t say that cheese changed our lives. Now, I love cheese, but it hasn’t made that much on an impact. The truth is though, there are some things that have and one of those things is kefir. I’m sure some of you are saying “Ke—what?” I was there, too. I was one of those people once upon a time who had no idea what is was but that didn’t stop me- I wanted to try it. My dear friend, Stacy, has an extra grain or two and sent them my way with instructions on how to use it and the results have been amazing. Emma had RSV last winter which strongly increases her chances of having asthma. It doesn’t help that I was diagnosed with asthma when I was 16 (I had exhaustion-based asthma before then) and that increases her chances, too. This fall, Emma’s cough returned with a runny nose and after bringing her to the doctor and hearing this was normal, I was not satisfied. I thought there had to be SOMETHING that could help and there it was—kefir. Since we’ve started a daily diet of kefir, Emma’s cough and runny nose haven’t returned and what a blessing that is! Here’s a little about it and how we use it. Kefir, pronounced /kəˈfɪər/ , is basically fermented milk that is a GREAT source of probiotics. Simply as that. It has a similar consistency to yogurt or sour cream, depending on how thick you make it. The kefir comes from kefir grains, which are a culture made up of bacteria and yeast in a dairy substance. 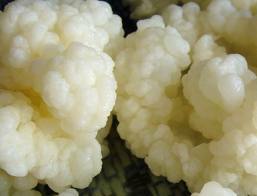 Kefir grains remind me of cauliflower which I hate. Sorry if I disappointed anyone. Back to kefir though. Something amazing about the kefir grain is they cannot be manufactured meaning they are a REAL FOOD. Can I get an amen? AMEN AMEN AMEN! Not too much is known about how kefir grains came to be but it seems they came from Russia. Thanks, Russia! I owe you one. Kefir has several strains of bacteria and yeast that feed good bacteria in our digestive tract and also contains many needed nutrients, including vitamin A, vitamin B12, vitamin D, calcium, and more. Something I found interesting during my study on the benefits of kefir is that most people don’t understand how kefir really helps fight off illness when it primarily works in your intestines/digestive region. What we need to know is that the majority of our immune system lives in our digestive tract and almost all common illnesses come from something related to our digestive system. I’m glad kefir is smarter than I am. The next big question I get is what in the world to do with it. This is a GREAT question. I would recommend looking into it after you read this post. Just because I do it a certain way doesn’t mean it needs to be your way. I will share with you how I make kefir from the grains and how we incorporate it into our diet. First off, if you’re not making kefir be sure to keep your kefir grain(s) in a container in the fridge covered with milk. Baby food containers are great for this! You will need to empty and feed it every 7-10 days (do NOT rinse with chlorinated water- it will kill it). 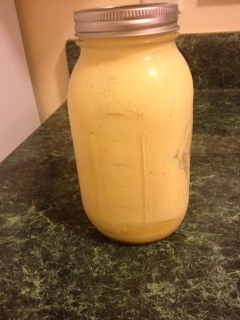 Once you decide to make kefir you will pull the grain(s) out of the fridge, put them in a container (preferably a mason jar), pour a cup of milk in with it (whole is best), put something over it (but do NOT tighten it or the gases will cause it to have a mini explosion), and let it sit. Some people wait 24 hours but I like to wait 48. Other people wait up to 72 but that’s too long for me. You just have to find the consistency you like. Remember while it’s growing to sit it in a place out of direct sunlight because that can kill it, too. My favorite part comes next. Get out another mason jar and find a funnel that fits in it. You also need a strainer and I’ll be honest- I went to the dollar tree and bought a sink strainer just for this. It fits PERFECTLY. After all the liquid has strained, you have kefir! It can be stored in the fridge for several months but be warned- it can get moldy if it’s in there too long. Be wise in how long you keep it. Also, the smell will be similar to sour cream but it won’t be so strong it knocks you over. 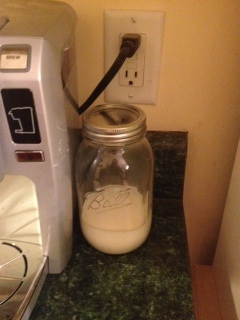 You can continue making batches of kefir or you can put your grain(s) and milk back in the fridge. One more quick tip here: you can kill kefir grains. 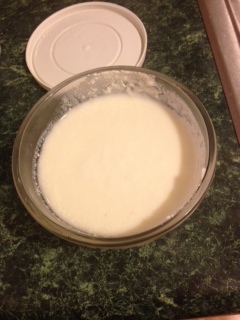 I’ve done it and the smell is awful and the texture of kefir it makes is even worse. You won’t be able to doubt that you’ve killed it. Our favorite way to do kefir is in smoothie form. I make a base with yogurt and a fruit of some sort. Right now, we’ve been doing 1-2 cups organic vanilla yogurt with ½-1 cup organic pumpkin puree. I just put it in the blender and go to town. This stores in the fridge based on the expiration of the yogurt. 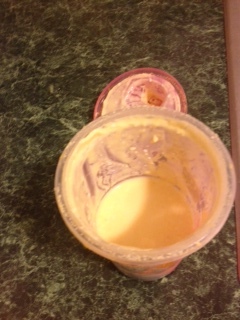 When ready to eat, I mix 2/3 cup smoothie base with 1/3 cup kefir. This isn’t measured by a measuring cup but rather the size of the cup itself. Now I’m going to be honest here, too. Sometimes kefir can have a bitter taste and for picky eaters, it may take some time to find a mixture that works best for you. I promise you this though- once you find the mixture that works for you, you will LOVE it. Emma can drink kefir straight but I just don’t feel right about that when I can add in some yummy fruits to go with it. Some of our favorites are organic pumpkin puree, strawberries, blueberries, and peaches. Another way we use kefir is in the form of buttermilk or sour cream. If a recipe calls for either of these, we pull out the kefir. It is usually a little thinner but not enough that we notice and it tastes great. What a great way to get some extra probiotics! I’ve read recently about making cream cheese with kefir but we haven’t done that yet. I have made homemade cream cheese out of milk before and that’s great, too. Another benefit to it is that you can up your amount based on illnesses. We always go up when Emma gets bad diaper rash (fights off yeast infections), we’re around someone with the flu, or are just feeling plain yucky. Kefir has changed our lives- is it changing yours? as I was woven together in the dark of the womb. You saw me before I was born. Every day of my life was recorded in your book. Last Thursday, we were blessed with the opportunity to meet a precious little girl. 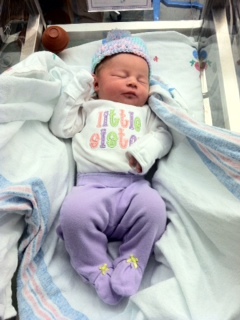 Piper Emry was born on Thursday, January 17th at 8:31am weighing in at 7 pounds, 6 ounces. She is the daughter of Eric & Suzi Reynolds and the little sister to Mollie Reynolds. Join me today is welcoming this precious gift into the world! How blessed we were to be in good enough health to bring dinner and visit with the new family last week! Due to the snow storm the day she was born, we ended up having to wait longer than we wanted but I’m sure that allowed more time for everyone to get in a routine. Piper is a very chill baby and reminded us of Emma when she was little. To be honest, it slowly got me wanting another baby and even though I don’t think now is the time, it’s growing on me daily. Holding Piper definitely bumped me up a little closer! One thing that shined above everything else is how very blessed Piper is to be born into this family. Even though she doesn’t know it and it will take her some time to realize it, God has truly given her a family that will love, guide, and protect her all the days of her life. Her parents had fallen in love all over again and Mollie watched over her with protective eyes, making sure everyone who came near Piper met her approval. How wonderful to be born into such a great family! For anyone who knows Eric and Suzi, you understand. They are truly amazing people and we are blessed to know them an be a part of their lives. Words cannot describe the importance of being born into a family that knows the love of Christ. Eric and Suzi are wonderful examples of Christ’s undying love for us and I know they will show it to their children because they show it to everyone, including Mollie and now Piper, too. We are praying for them as they raise their children in the path God has set before them and ask for long and healthy lives for all of them.Please join us in this prayer! 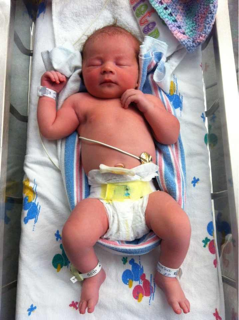 Welcome to the world Piper Emry and congratulations dad, mom, and big sister! *We buy in advance: I am regularly looking for dressy outfits. I don’t have 20. I don’t have 10. I try to keep 2 available during all seasons just in case and the only way to find these for an affordable price is to look before I need them. If I wait until then, it’s too late and I’m shelling out enough money to cause me to have a premature heart attack. *We always have outfits on hand: This goes with our first point. We ALWAYS keep outfits available. ALWAYS. Sometimes we wear them and sometimes we don’t. But we always have them available and hanging in Emma’s closest ready to go at a moments notice. You don’t know the peace of mind this brings me in knowing that I have clothes on hand ready to go when I get that call. *We shop clearance and consignment: We don’t have an abundance of extra money to spend on clothes that Emma may never wear. For these clothes, we always shop clearance and consignment. If there was ever a time I would NOT buy full price, it would be on dress clothes. Last year I was able to find Emma a cute winter dress for $4 at Wee Cycle It. What a deal! Even if she never wears it, I can rest easy knowing it was cheap frugal and I can easily get my money back. *We borrow: We’re never afraid or too proud to borrow from friends. There are times we may be in a bind and need something quick and not have time or luck finding what we’re looking for at a price we’re willing to pay. We have friends who are generous enough to share with us and keep us from spending an arm and a leg. We want to be those friends in return to others. Everyone needs a hand every once in awhile and we want to be known as those people who are willing to offer help and assistance where needed. *We make it work: Sometimes we’re just out of luck. Either the outfit isn’t the right color or the right style. Sometimes we just have to wing it. Fortunately though, this is where I feel like I shine. I absolutely LOVE to create and make new outfits. I feel the challenge to make something better than I can find and I usually rise to the occasion. Now, I’m not trying to brag on myself. Well, maybe I am. I share enough of my flaws so I deserve some proud moments every once in awhile, right? Seriously though- this is something I love to do. Game on! *We make our money back. We buy stuff for cheap, remember? Well, Wee Cycle It rolls around twice a year and you better believe unless I fall in love with said outfit, it’s going to the sale. Now, I don’t jack the price up beyond what we paid for it. I charge what it’s worth. It’s a great way to make back what we’ve spent and since we bought it for cheap anyways, we’re able to make that money back easy. Don’t you love that? I sure do. Most of Emma’s clothes we’re keeping for baby #2 but believe you me, we’re hitting the jackpot once we sell those clothes! Mommy confession time here. I already have 4 ½ full boxes of Emma’s clothes in the attic and she’s only 17 months old. No joke. 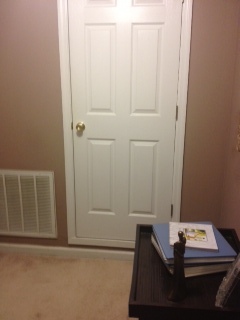 Oh, and did I mention the closet/dresser full and the 2 boxes in her closet of next sizes? Yes, I know. I might be addicted to baby clothes. This is how we prepare for Emma to dress her part when asked. It’s fun to do and really does feel good to be prepared. After all, it is Biblical. I hope this has helped you prepare, too! 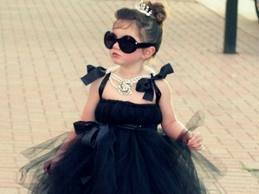 How do you prepare your child for events that they need to wear things dressier than normal? *Unconditional love-First and foremost, I have to show my daughter that my love for her will never change. My mom was great at this. There were a lot of times that I’m sure I didn’t deserve it. I’m not sure I’ve ever or ever will earn it. Despite all this, my mom loved me regardless. *Forgiveness- This is a big one. Letting go of the past and moving towards the future is one that we all need, even if we don’t deserve it. My mom has always set the example of forgiving me, even when I don’t always ask for it, and I’m so glad she has. Her example has made it easier to comprehend the forgiveness Christ offers me on a daily basis (lets be honest- more than that!). I pray forgiveness is practiced regularly by me towards Emma. *Comfort- Whenever I get sick, do you know who still brings me food? My momma. She has always been the person I want when I’m sick and after nine and half months of standing strong and saying I could have Emma without her, I realized how much I needed her there (long story short- when you have a c section, only one person could come, so I did do it without my momma- even though it wasn’t what I wanted). My mom has always comforted me in a way that no one else can and I want to offer that comfort for Emma.I want to be the one she wants in her time of need. *Providing for needs- This isn’t the same things as wants. My mom was very clear with us the difference between our needs and wants. She took care of our basic needs and always put ours before her own. I can remember numerous times that my mom would rush around to get our dinner together, healthy nonetheless, and grab whatever she could for herself. My momma is good like that and I’ve definitely learned that it’s something that seems to come naturally as a mom. You put your child’s needs way before your own. *Meeting some wants (without going to extremes)- There were wants that Erick and I had that we didn’t get. That’s just life and my parents were both great at teaching us that sometimes, we have to wait for what we want. And sometimes, we never get what we want. For Christmas one year, when we didn’t have a whole lot of money, I had my eyes on a pair of genuine leather Steve Madden shoes. I loved them. I watched them for months in the store and knew it was a long stretch to get them. I don’t even remember asking for them to be honest with you. But somehow on Christmas morning, there they were. My momma had saved her money and went out and bought them for me. I worn them for ten years until last year one of the straps broke. I haven’t been able to find someone to repair it but I don’t plan on throwing them away. Ever. Sure, I love the shoes. But I love the memory even more. By the way, if anyone knows a GOOD local shoe repair place, let me know! *Being there when no one else is- There are times in your life, especially as a child/teenager, where you feel 100% completely alone. I’ve been there. And you know what? No matter what I did and even if I deserved the lack of friends, my mom was there for me. I knew at the end of the day, she always would be. I want Emma to have that same comfort in me. I want her to know that no matter what happens, her mom will never leave her side. *Showing flaws- My mom makes mistakes, she’s not perfect, but that is part of what makes her so great. She makes is known. She doesn’t hide behind fake perfections that don’t exist. She has flaws that she doesn’t excuse, but she doesn’t hide them either. I’m working daily on trying to be more transparent about who I am. I heard a message the other day where Matt Chandler said, “*we need to be willing to share and show that God works and makes beauty from the mess; don’t take that from your people. We have to show it!” The same would be true with our children. I want Emma to know that God can make beauty out of my messiness, flaws and all. *Showing Christ in all we do- This really goes without saying. Once you read all the above that my mom did and still does for me, she shows me daily that Christ is real. He is who He says He is. He is infinitely more than I could imagine and the love she has for me is the earthly example of His love for His children. I pray that my life shines for Emma to see who Christ is. I pray that she is able to comprehend His love based on the love I show her. These are the things that I’ve found in my mom that make her great and I pray that I can show these same things to Emma. I ask daily for God to guide and direct me to be the mom I know He has created me to be. I pray we all do! 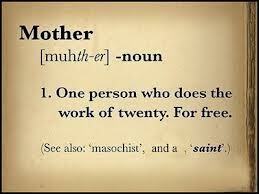 What characteristics do you see that define the meaning of mom? *Enjoy life. Life is too short to spend it worrying and stressing about things that don’t matter. After all, God is in control of everything. This isn’t to say that you just act careless. If you’re wise in how you live (ie: be wise with your money, choose your friends carefully, always do your best, and more), you can spend even more time enjoying life than most! Live life to the fullest and work towards living a life that you would be proud of and want others to live. *Think before you do anything. You can never take back something you say. You can never take back something you do. Sure, you can make it right but you can never take anything back that has been done. It’s better to think it through than to do it and regret it later. You are going to make mistakes, however, and when you do- make it right. Don’t wait for someone else to make the first move. Be humble, be the bigger person, and do your part to make something right. It may not take it back, but it will make a difference. *You are beautiful. When you were born, we had countless people tell us that you were the most beautiful baby they had ever seen and to this day, it continues. Your love and appreciation for everything in life makes you even more beautiful and I love watching you embrace life and live it to the fullest. No matter what people say your beauty, first and foremost, is found in the love of your Savior. You are His precious treasure and He made you in His image. What could be more beautiful than that? I know that because His word says it. What a beauty He has given us- both inside and out! *Fall in love, get married and have kids! You are the BEST thing I’ve ever done with my life. When your dad and I decided to have a baby, we knew it would be the best decision we’d ever made but didn’t realize HOW wonderful it would be! When I hear people say that their child completes their life, it is so very true. You have made our lives better than we could have ever imagined and I am so blessed and amazed that God has allowed me to be your mom. I could never thank Him enough for this privilege. *Your dad is the best man you will ever meet. Don’t get me wrong- you have A LOT of great men in your life, but none will compare to your dad. He is the man God created for me and has loved me in ways that I could never imagine and been the BEST dad you could ever ask for in this life. When you were born, I was able to witness his love for you happen in just a moment. It was like he had known you his whole life. Everything he said to you was in his eyes and I know that he loves you more than life itself. Look to him as an earthly model for how a man should treat a woman and NEVER settle for anything less than that. Your dad definitely is that model and still melts my heart today. *I love you as close to unconditionally as I know how. I am not God and my love will never compare to His, but as best as I know how, I love you unconditionally. You are one of the most important things God created me for and I know He has a great plan for you! I love you no matter what road you take and where you go in life. Nothing could make me love you any more or any less than I do right now. When I first found out that I was pregnant with you, I was in love. I loved you with everything in my being and knew in an instant that I would never take another breath without thinking of you first. You are my precious gift from God and I am so glad that I am able to call you my daughter. *Jesus died for you and wants you to let Him into your heart! A relationship with Him is the most important decision you will ever make in your life! No one will ever love you like He did when He died on the cross for you and you will never be able to love to the fullest until you understand and accept that love into your life. His love gives you such meaning and purpose- He completes you in every way. No relationship will ever be more important or more essential in your life than the one with your Heavenly Father. Turn to Him in all things. He will be there for your happiest moments, your saddest moments, your most difficult moments, your proudest moments, and more. God will be your greatest love if you allow Him to be- He was pursuing you before you were even born. If I had all the time in the world, I would say more. I would write pages and pages. I would talk to her for hours on end. This puts together the MOST important things I would say. I would encourage you to the do the same for your children, your spouse, and more. We never know when we’ll take our last breath and I want to know the ones I loved most know I loved them. 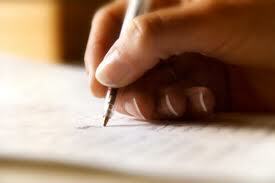 Have you ever written down a letter for your loved ones?